On my last birthday, my mother called me from Bangkok to give me her blessings — something she’d always done. Inexplicably, as I ended the conversation by telling her that I loved her, tears started flowing and continued on and off for hours afterward. And I couldn’t understand where the emotion came from. It was as if I knew. Mom passed on peacefully two days later. Yet stiff with meaning, struck my senses sick. One of the most difficult days of my adult life was the day I walked into Mom’s dusty room just a few weeks ago to collect her things and gathered up all the important documents which she left behind. I’d been dreading that moment and it took all the strength I had to do what I needed to do. Yet knew before I laughed, and so was still. That book, outspread, just as you laid it down! So rose, and left it, thinking to return. The room had been left undisturbed since she was gone. Her diary was still laid open on her desk showing an unfinished journal entry. On her nightstand was a framed photograph of Dad looking so handsome in his full uniform. Right next to it was a picture of my brother and me, when we were little, sitting on a big rock under a chompu tree, making monkey faces. And will not ever enter here again. Would kiss me from the door. Mom’s unfinished crochet project sat on top of the dresser, collecting dust. In her desk drawers were stacks of notes and letters I’d written her since I started learning how to pick up a pencil and write. Somewhere in there was a box full of postcards Dad sent home when he traveled the world over as an officer pilot. Then sitting quietly on the coffee table was a tiny ceramic urn with intricate gold designs and pearl inlays. There she was. My mother. In an urn. As knots started forming in my throat, my vision fell on something that made me smile. Nestled between two teak wood armoires was a stack of old cookbooks. Even from across the room, I recognized them immediately. When I was a kid, Mom made friends with some American missionaries who lived and worked in Bangkok. When these Americans finished their term and got ready to return to the States, she noticed they had this strange custom of laying miscellaneous items on the front lawn and sold them to whoever passed by for very little money. 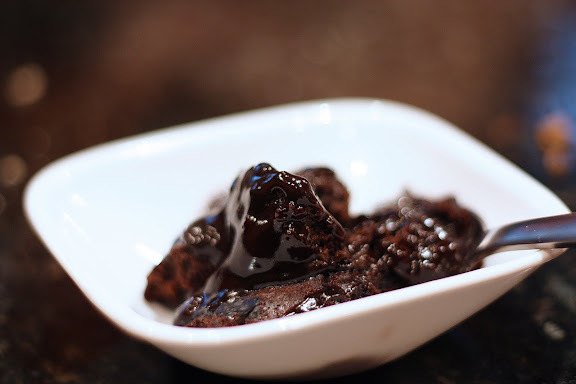 Fascinated by the description, one of the first recipes Mom tried was this old-fashioned hot fudge pudding cake. A cake that forms a crust on top with pool of thick chocolate sauce underneath? It seemed so strange that we had to find out what the end result would look and taste like. The way the cake was supposed to be made went against everything we knew about how to make cakes. It was extremely easy, but I remember us cringing the whole way through, thinking this would definitely fail. It didn’t. The pudding cake turned out exactly as the recipe described. It wasn’t the most beautiful cake you’ve ever seen, mind you. But the aroma of the bubbling chocolaty goo wafted through the entire house making the mandatory 10-minute wait post-bake feel like an eternity to us. But oh, the wait was worth it. My mother took one bite, closed her eyes, and thanked the Christian God. In attempting to recreate this cake, I have taken the liberty of adding an Asian twist to it. Coconut milk is used in lieu of cow’s milk and coconut or palm sugar is used in place of brown sugar. A very tiny bit of five-spice powder is added to the batter for that je ne sais quoi which everybody seems to like. I love the original, but this version is just as delicious — in a different way. 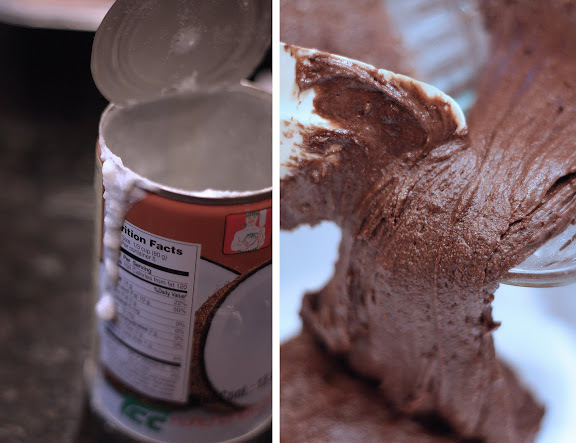 Once the oven is preheated to 350° F, I make the batter by whisking together 1 cup all-purpose flour, 1/2 cup granulated sugar, 1/4 teaspoon salt, 2 teaspoons baking powder, 1/8 teaspoon of five-spice powder (optional), and 1/4 cup unsweetened cocoa powder. To the flour mixture, I whisk in 2/3 cup of coconut milk, 1 teaspoon of vanilla extract (or coconut extract), and 2 tablespoons of melted butter.Once the mixture forms a thick, cohesive mass, I spread the batter onto the bottom of an ungreased 8×8 glass or porcelain baking pan. 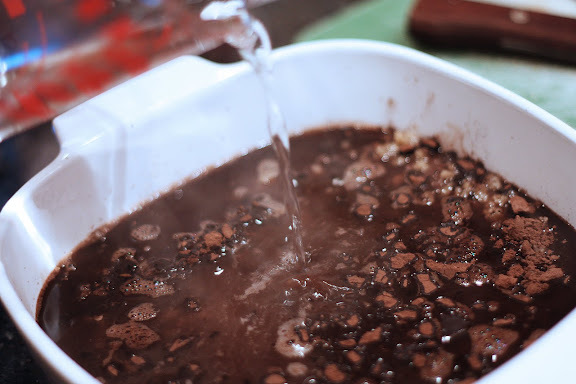 One cup of finely grated coconut or palm sugar is sprinkled evenly all over the surface of the batter, followed by 1/4 cup of unsweetened cocoa powder. Then 1 1/2 cups of boiling water is poured on top of everything. The cake is baked for exactly 30 minutes. At the end of the baking time, you’ll see that a crust has formed on the top with a pool of gooey sauce bubbling underneath. The cake needs to rest at room temperature for 10 minutes to allow the sauce to thicken up to pudding consistency before serving. This post is affectionately dedicated to my mother — a cookbook addict who could have been spotted several years ago rifling through piles of old American cookbooks at yard sales with a funny-looking girl with pigtails (often dressed in a one-piece A-line mini-dress and a pair of junior cowboy boots) in tow. Happy Birthday, “Leela”. I’m so sorry your dear mum isn’t still here to give you her birthday blessings this year. Always love reading your blog. Chocolate, Coconut and pudding?! Now I can’t think about anything else until I have this creation. Great blog! Happy birthday. I can’t imagine how you must be feeling with the first anniversary of your mom’s passing. But you’ve made a wonderful pudding cake to keep those memories alive. Your mom would have been proud. She’s most definitely smiling down at you. That cake does look really good. Though, I’m a chocoholic so I’d definitely eat this right up. I’m glad you found some happy memories to sustain you through a difficult job. Your pudding sounds lovely with chocolate and coconut, and the hint of spices would be perfect. I, too, lost my father suddenly, and since he lived across the country from me we never got a chance to see him before he passed. One of the hardest things about his loss was, aside from the obvious, the fact that one day, he planned to take us to his beloved Thailand, where his heart had been ever since he traveled there 20 years ago and met his wife. Perhaps I will still make it there someday, but it will not be the same! Your beautiful story and writing far out-does the recipe, but oh-boy do I want to make it right now! I love the idea of the 5-spice powder and coconut milk. My first thought would have been a good strong chile addition in the vein of the “Aztec” or “Mexican” type chocolate-chile combination you see so much these days, but in keeping with the asian influence, kaffir lime zest and ginger and bird’s-eye chiles would be a truly excellent combination, I think! 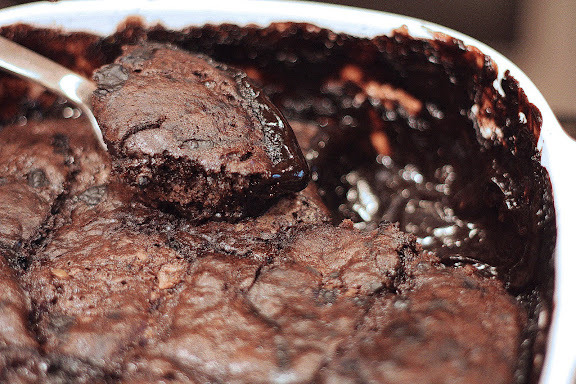 So I may just have to experiment with this recipe several times…afterall, you can never have too much chocolate! Happy birthday Leela. This post moves me, I know you’re a tough girl! The thoughts of your mum and making the cake are so sweet. A warm memory of a loved one are always welcome when we are sad. Thank you for sharing. What a lovely post! The interspersing of your images within the text is brilliant. I particularly love the placement of the empty can of coconut milk after the silent rocking chair. Lyrical. Moving. What a beautiful post and heartfelt tribute to your mother. Thank you for sharing both sweet and bittersweet memories with us. You have reminded me to not let the minor vagaries and stresses of everyday life interfere with keeping in touch with my parents, who now live in the Philippines. I love your twist on this cake and can’t think of a more delicious combination than chocolate and coconut. This will definitely be made! Happy Birthday Leela – your beautiful tribute to your mother speaks to what an amazing woman she was, that she made such an impression on you is a gift she gave that keeps on giving. I for one am grateful at the keen eye and insight that you provide to food, that may not have come into its own if it were not for your mother sharing her culinary love and expertise with you. Thank you for giving us this gift on your birthday! What a beautiful tribute to your mother, and what lovely memories of your mom and the cookbooks from the yard sales. I am so sorry for your loss, but I am so glad you have such wonderful memories! The cake looks lucious and so tempting! Lovely work! Belated Happy Birthday, Leela! And I’m sorry your mom is not there to share it with you. Happy Birthday! That was a touching, sad, bittersweet, and lovely post. Your changes to the cake sound fantastic, and your visits to yard sales with your mother sound like a lot of fun. Belated Happy Birthday, Leela 🙂 I was very touched by your tribute to your mom and the wonderful memories you shared. Maybe you were indeed clairvoyant– your bond was/is really that strong. I can feel the love flowing through your words. What a wonderful dedication to your mom! The chocolate pudding cake sounds amazing and I love your twist with adding coconut milk and 5-spice powder! Happy birthday! Happy birthday and sorry for your mom past. Sorry to hear about your mother. This is a great post in her memory. Hope you had a happy birthday. I’m so glad you shared such a powerful memory of your mother. I collect cookbooks from yard sales. You are right, the best recipes come from the community church cookbooks. The cake sounds simply divine or is it sinful? I don’t care, I bet it’s delish! Ok, i am loving the addition of the coconut milk in this recipe. i can only imagine how creamy and sweet this would make an already creamy and sweet dessert! i am LOVING this. i may have to give this one a try before the holiday eat-fest begins! happy bday (WAY belated) and the story around this great dessert was really lovely. A very touching tribute to your mom! It’s nice you have wonderful memories to cherish. As a mother, I hope my son will have such fond memories of me too. There is one horrible thing about this cake…it’s 1:00 am in the morning, I came across this post an hour ago & now I am waiting the last few minutes while it cools….I did the original version, which just happens to be made of ingredients always found in my kitchen….not a good combo for this late at night! Thank you for this! I think this may now be my fav thing EVER! How amazing it is that food can bring our memories to life. My grandmother makes a ‘cake’ just like the traditional one you made with your mother and it is wonderful! I have never seen it anywhere else and was amazed that this wasn’t some secret family recipe from here in Maine. We refer to it as Chocolate Lush :). I’m excited to try your version and maybe do some experimenting of my own.